The last several times I've visited Whole Foods, I've noticed a box sitting on the shelf in the baking aisle that catches my eye. It's a baking mix for Gluten Free Dutch Chocolate Cake. The difference between this baking mix and the many other gluten free chocolate cake baking mixes that line the shelves is that this mix uses imported Italian chestnut flour! I finally decided to buy a box and try out this chestnut flour! Instead of baking a Dutch Chocolate Cake, I made a tray of cupcakes. The mix is extremely easy to put together and takes little time to prepare. It also comes with 2 pouches: one with the flour blend and the other containing the organic evaporated cane juice crystals. This gives you the option of deciding how much sweetener you want to add or if, in fact, you want to substitute it with a non-sugar sweetener. I chose to use what they provided. The cupcakes turned out to be absolutely delicious! They are moist and not thick as many gluten free cupcakes can be. I definitely plan on using Italian Chestnut Flour in more of my baking. Dowd & Rogers products are available at many health food stores. You can also purchase them online at Ms. Celiac's Market! For more information, please visit their website at www.dowdandrogers.com! Happy Birthday S'Mac - GF Mac & Cheese for $2 Tomorrow! S'Mac aka Sarita's Macaroni and Cheese is a restaurant located in the East Village at 345 East 12th Street between 1st and 2nd Avenues. They have a wide selection of macaroni and cheese dishes all available with gluten free pasta for an additional cost. Tomorrow S'Mac celebrates their 4th Birthday! And to celebrate, they are offering their Gluten Free All-American Nosh for only $2.00 all day (and with regular pasta for $1.00)! For more information, please visit www.smacnyc.com. Please note that this offer is limited to one per person and valid for takeout only! It is so refreshing in the summer months to enjoy some ice cream when the weather gets unbearably warm! But if you need to avoid dairy or are on a vegan or raw diet than this is not always an option. 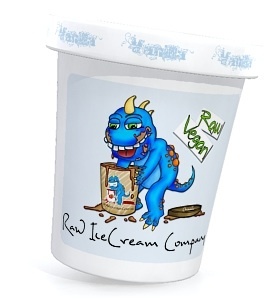 In that case, I recommend you try ice cream from the Raw Ice Cream Company! The Raw Ice Cream Company was one of the vendors at the Fancy Food Show. Their ice cream is gluten free, dairy free, soy free, rice free, raw, vegan, and contains no thickeners, fillers, preservatives, gums, stabilizers or oils! Their ice cream is made out of raw cashews, raw coconut, raw cocoa, agave nectar, cocoa butter, water, raw vanilla bean, sea salt, and a few other additional ingredients depending on the flavor. Why do they believe you should eat raw? Well, they choose to use raw ingredients because heating destroys the natural enzymes found in food. These raw foods have higher nutrient values than foods which have been cooked! The Raw Ice Cream Company's Ice Cream is also organic and pareve. 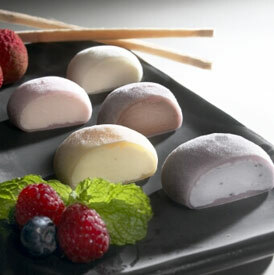 For more information on where to purchase their ice cream near you, visit their website at www.rawicecreamcompany.com. One of my long time favorite gluten free companies is Jo-Sef's Gluten Free. They also happened to be at the Fancy Food Show last week in NYC. One of the great things about their products are that they all have undergone ELISA testing to check for gluten and have been certified gluten free by the CSA. Their products are processed in a dedicated Gluten Free and Kosher facility. In addition to their certifications, all of their products are dairy free, casein free, lactose free, egg free, nut free, as well as, being free of trans fats and preservatives. Their products are also vegan. I always use their Vanilla Square Cookies when making gluten free s'mores! They are the perfect graham cracker alternative! Keep up-to-date with their latest products by following them on Twitter or Facebook or by visiting their Gluten Free Blog. For more information, please visit their website at www.josefsglutenfree.com. 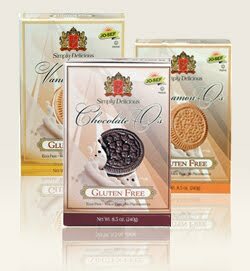 Jo-Sef's gluten free products are available at many health food stores or online at Ms. Celiac's Market! Looking for the perfect gluten free snack to bring with you to the beach or the park? 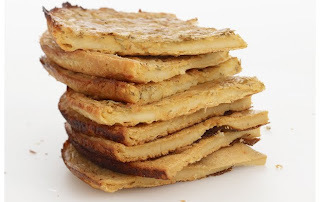 A snack that everyone will enjoy - not just those on a gluten free diet? Well, why not bring Pirate's Booty?! Pirate's Booty is an all-natural snack made out of baked rice and corn puffs. It is gluten free and trans fat free! 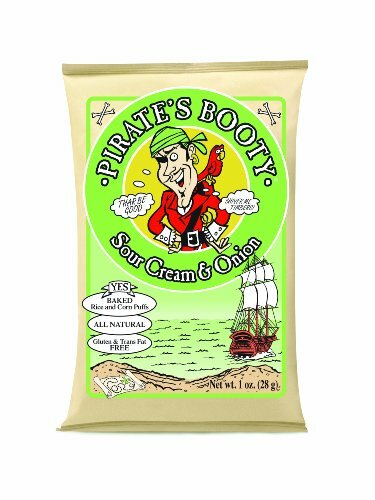 Even better is that Pirate's Booty is widely available. You can find it in the natural food aisle at your grocery store or at your local health food store. Or you can choose to order it online at Ms. Celiac's Market! While on Facebook, why not become a fan of Ms. Celiac's Facebook Page too so that you can stay up-to-date on all of the latest gluten free happenings! Just click here: Ms. Celiac's Facebook Page. One of the many delicious foods I was able to sample at the Fancy Food Show in NYC was called Cinque e Cinque by the company Lucini. Cinque e Cinque is a custom milled chickpea flour based mix that is originally from Livorno, Italy. It takes less than 30 minutes to prepare and once ready it makes for a yummy chickpea frittata that is crispy on top and soft underneath. There are many wonderful health benefits to Cinque e Cinque. In addition to being gluten free, it is dairy free, nut free, and vegan! It is also high in fiber, has a low glycemic index, contains zero grams of trans fats, is high in protein, and contains no sugar or additives! And there are many ways to enjoy this all-natural treat. You can top it with fresh arugula and balsamic vinegar for a nice appetizer or serve with fresh tomato sauce and cheese for a meal or even drizzle with extra virgin olive oil for a snack! For more information or to purchase Cinque e Cinque, please visit their website at www.lucini.com!